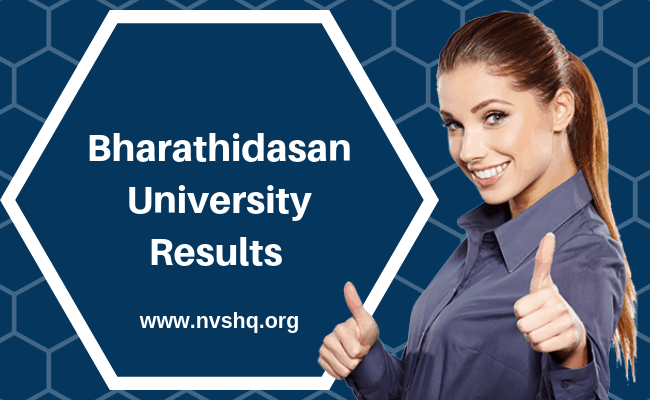 Bharathidasan University Results 2019: Bharathidasan University is a public state university located in the Tiruchirappalli district of the state of Tamil Nadu. It is an affiliating university established in the year 1982 and named after the revolutionary Tamil Poet, Bharathidasan. BDU has released Nov Examination 2018 Revaluation Notice. BU has two campuses viz Palkalaiperur Campus (Main campus) and Khajamalai Campus (Urban -52.56 acres). It has 146 affiliated colleges spread in the various districts of Nagapattinam, Karur, Pudukkottai, Tiruvarur, Tiruchirapalli, and Perambalur of the state. University has 4 faculties, 37 departments, and 16 schools offering various UG, PG, diploma and research programs in various disciplines. Apart from the regular program university offer 15 UG and 26 PG programmes through distance education mode. It has around 230 faculty members and teaching staff that caters to 2372 students and research scholars of the university. 1.8 How to check Bharathidasan University Results? In this article, you are going to get all the important information regarding the annual and semester exam result of Bharathidasan University. Check Bharathidasan University Nov 2018 Exam Revaluation Notice here. Quick Update 8/02/2019: BDU has announced Nov 2018 Examination Results. Candidates can check it from below links. BU has been ranked 94 in overall category and 67 among universities by The National Institutional Ranking Framework (NIRF) in the year 2018. Admissions in BU are mainly done on the basis of entrance exams and merit of the students in the qualifying exam. University conducts separate entrance exams for all the programs. The entrance exams are generally conducted in the month of June every year. To get admission in the university, interested candidates have fill an application form first. Candidates can avail application forms from the university website or from the registrar office. The application forms must be submitted before the due date. Application forms are released in the month of April for admission into the university. After the successful submission of application, university issue admit cards to the registered candidates which they have to carry to the exam center on the day of the entrance exam. University curriculum is based on both semester systems and non-semester system (i.e. on yearly basis). University also follows a Choice Based Credit System (CBCS) for many of the courses. All the UG and PG programs along with professional courses like MBA, MCA etc. are conducted semester systems and all the other programs like M.Phil., Ph.D. and few others are conducted under the non-semester system. The exams for all the odd semester exams for all the UG and PG programs are conducted in the month of November/December. The odd semesters exams are conducted in May/June each year. The final exams for Full-time M.Phil program is conducted in the month of January/February and in May for M.Phil Part-time program. Only those students are allowed to sit in exams who fulfills the university credit and attendance criteria. The results for odd semester exams are declared in December/January and even semester exams in June/July. All the university results are declared only through the online mode. Students can get their results from the official university portal. The result includes the name of the student, roll number, registration number, semester, year, credit, subject-wise marks, total marks, result status etc. Students can collect their mark-sheets/ marks card from the university/affiliated colleges on the specified dates. How to check Bharathidasan University Results? Find the “Examination” Tab on the homepage. Select the Exam Result option. Enter the register number and click on submit. The result will appear on screen. Lastly, students can save the result for use/reference in future. When will get M.Phil management studies result for 2018-2019. When will get UG bio chemistry result?